Following resection of liver metastases from colorectal cancer, 5-year survivals are reportedly 30 – 39%. It can be assumed that this clinical situation represents systemic disease. Therefore, it is postulated that systemic chemotherapy would improve outcomes, particularly in those whose disease is sensitive to the agents administered. One potential advantage of neoadjuvant chemotherapy is that it provides in vivo chemosensitivity data. Response to neoadjuvant chemotherapy could therefore guide adjuvant chemotherapy following resection of liver metastases from colorectal cancer. This is a prospective Phase II evaluation of outcomes in patients with potentially resectable liver metastases. Patients will receive neoadjuvant chemotherapy and will undergo resection. Postoperative chemotherapy will be directed by the degree of response to preoperative chemotherapy. All patients with Stage IV colorectal adenocarcinoma isolated to the liver that have disease that is amenable to complete ablation by resection, radiofrequency ablation, and/or cryoablation will be candidates for the trial. Patients will receive CPT-11 180 mg/m2 IV (over 90 minutes) on day 1 with 5-FU 400 mg/m2 bolus and 600 mg/m2 by 22 hour infusion and calcium folinate 200 mg/m2 on days 1 and 2, every 2 weeks. Altogether, six cycles of chemotherapy will be administered. Patients will then undergo resection and/or radiofrequency ablation. Patients who had stable disease or a clinical response with preoperative chemotherapy will receive an additional 12 cycles of CPT-11 180 mg/m2 IV (over 90 minutes) on day 1 with 5-FU 400 mg/m2 bolus and 600 mg/m2 by 22 hour infusion and calcium folinate 200 mg/m2 on days 1 and 2 (given every 2 weeks). Patients with resectable disease who had progressive disease during neoadjuvant chemotherapy will receive best supportive care or an alternative agent, at the discretion of the treating physician. Those patients who are not rendered free of disease following the neoadjuvant chemotherapy and surgery will receive best supportive care or an alternative agent, at the discretion of the treating physician. The primary endpoint of the study is disease-free survival. Secondary endpoints include overall survival, safety and feasibility, response to chemotherapy, and quality of life. Colorectal cancers are the third most common cause of cancer death in North America. The liver is the most common site of metastasis. In patients with resectable liver metastases, there is a good probability of long-term survival and even cure . Untreated liver metastases are almost uniformly fatal within 5 years of diagnosis and median survival of patients with technically resectable liver lesions who do not undergo surgery is about 14.2 months . There are no good data concerning survival of patients with resectable liver metastases who receive systemic chemotherapy and do not undergo resection. On the other hand, following resection, median survival is 19 – 30 months and 5-year survivals are reportedly 30 – 39% . Fluoropyrimidines such as 5-fluorouracil (5-FU) and 5-fluoro-2'-deoxyuridine (FUDR) are among the most active chemotherapeutic agents for the treatment of colorectal adenocarcinoma. These agents are used as adjuvant therapy following resection of the primary tumor or as primary therapy for control of unresectable metastases. In general, the response rate for metastases from colorectal cancer to fluoropyrimidine chemotherapy is 17–23%; a higher likelihood of response can be expected with concomitant leucovorin . The value of adjuvant fluoropyrimidine therapy following resection of liver metastases has not been well studied. However, a recent study from Memorial Sloan-Kettering did demonstrate improved survival at two years in patients who received FUDR via a hepatic arterial pump in addition to systemic 5-FU compared to patients who received systemic 5-FU alone . These early results might suggest an important role for regional chemotherapy in these patients, but there are several potential problems with this approach. The most important issue is the complication rate associated with insertion of a hepatic arterial pump. A major surgical procedure is necessary; hepatic arterial chemotherapy is associated with hepatic toxicity; and complications such as hepatic arterial thrombosis, infection and pump failure are not infrequent. Therefore, while survival at two years appears to be improved, problems associated with the intraarterial administration of chemotherapy may have very real consequences in some individuals in the short term. The pumps are also prohibitively expensive. Therefore, identification of a strategy of equal efficacy using systemic chemotherapy is desirable on a fiscal front. Finally, the regimen described by the Sloan-Kettering group utilizes two fluoropyrimidines. As a proportion of patients are resistant to this group of antineoplastic agents [6, 7], one might anticipate some significant limitations with this drug combination. Because insufficient inhibition of thymidylate synthase may be an important mechanism of resistance to fluoropyrimidines [6–9], antineoplastic agents that operate by a different mechanism are most likely to be useful in combination. CPT-11 (irinotecan) has demonstrated significant activity against colorectal adenocarcinoma [10, 11]. CPT-11 inhibits the nuclear enzyme DNA-topoisomerase, leading to lethal accumulation of single-strand DNA breaks in the cell, a distinctly different mechanism of action than the fluoropyrimidines. Two randomized trials showed that second-line CPT-11 in patients with metastatic colorectal cancer improved length and quality of life compared to best supportive care  as well as alternative fluoropyrimidine-based regimens . The combination of CPT-11 with 5-FU/LV is therefore justified because they have distinctly different mechanisms of action and because each agent has significant activity in metastatic colorectal cancer. Saltz and coworkers reported a randomized trial in which a combination of 5-FU, LV and CPT-11 gave superior results to 5-FU and LV or CPT-11 alone, when used as first-line therapy for patients with metastatic colorectal cancer . Using this regimen, an objective response rate of 39% was seen, the median survival was 14.8 months, and quality of life was not compromised. These results demonstrated the importance of combining CPT-11 with fluoropyrimidines. Moreover, the regimen described by this group represents an excellent potential alternative to intrahepatic chemotherapy, in patients who have liver metastases amenable to resection. Douillard similarly reported on the combination of CPT-11 with infusional 5-FU in a randomized trial of 387 previously untreated patients . Again, the response rates were significantly better than those who received 5-FU alone (49% vs. 31%, P < 0.001). Moreover, time to progression was longer (6.7 vs 4.4 months, P < 0.001) and overall survival was improved (17.4 vs. 14.1, P = 0.031) in the CPT-11 containing arm. Although responses and survival benefits did not differ significantly between Saltz and Douillard regimens, the Douillard program with infusional 5-FU appeared to have a lower incidence of nausea/vomiting and neutropenia. Diarrhea is a common side effect of CPT-11 containing regimens. Grade 3 or 4 diarrhea was observed at similar rates with the Saltz and Douillard protocols (22% vs. 24%, respectively). The application of chemotherapy on a neoadjuvant basis has a number of potential advantages in patients with resectable liver metastases. The degree of response gives information on the in vivo chemosensitivity of the tumor(s). This may help to determine the appropriateness of further treatments with the same chemotherapeutic agents after resection. In nonresponders, the adverse effects of these agents are avoided and alternative agents can be considered. Administration of chemotherapy on a neoadjuvant basis may also enable selection of candidates for resection. That is, patients who develop extrahepatic foci of disease during a short course of chemotherapy likely were unsuitable for resection in the first place. Finally, in some instances, neoadjuvant chemotherapy may enhance resectability. Reduction of tumor volume may limit the amount of liver that will need to be removed to accomplish eradication of disease [16–18]. The general aim of this protocol is to determine the efficacy of neoadjuvant chemotherapy for patients with ablatable liver metastases from colorectal cancer in reducing recurrence rate. Response to the chemotherapy regimen will constitute an in vivo chemosensitivity test, and this will guide adjuvant chemotherapy following resection of liver metastases from colorectal cancer. The primary objective is to evaluate disease-free survival following neoadjuvant 5-FU, LV and CPT-11, resection/ablation, and post-operative chemotherapy. 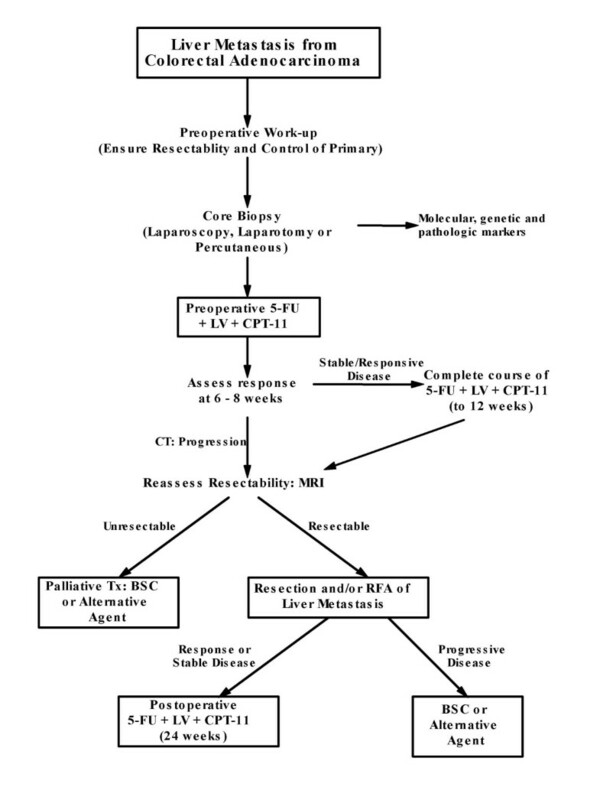 Secondary objectives include: a) to document safety; b) to assess the feasibility; c) to evaluate overall survival; d) to determine the objective response rate of liver metastases; and e) to assess quality of life during and after this multimodality regimen. The primary endpoint is overall disease-free (DFS) survival (including intrahepatic and extrahepatic recurrences). Secondary endpoints are as follows: a) safety (as measured by adverse events, toxicity from chemotherapy, and perioperative morbidity and mortality); b) feasibility (defined as tolerance of the complete course of preoperative chemotherapy in >90% of patients and completion of postoperative chemotherapy in addition to preoperative chemotherapy and surgery in >75% of patients); c) overall survival; d) tumor response to chemotherapy; e) quality of life; and f) histologic pattern of response. a) All patients with Stage IV colorectal adenocarcinoma isolated to the liver. b) At least one measurable lesion by CT or MRI. c) Metastases are technically completely resectable or amenable to complete ablation by cryoablation and/or radiofrequency ablation. d) Karnofsky performance score > 70. e) Adequate bone marrow function: WBC > 3000/mm3, absolute neutrophil count > 1500/mm3, platelet count > 100,000/mm3. f) Adequate hepatic function: bilirubin ≤ 1.5 × ULN, AST/ALR ≤ 3 × ULN g) Adequate renal function: serum creatinine ≤ 150 μmol/L or calculated creatinine clearance ≥ 60 ml/min. h) Age 18 – 70 years, inclusive. i) Men and women of reproductive age must agree to use an effective contraceptive method while on study. j) Women of childbearing age must have had a negative pregnancy test prior to registration. h) Informed written consent has been obtained. History, physical examination, chest X-ray, CT scan of the abdomen and/or MRI of the liver, and biopsy confirmation of at least one of the liver metastases will be required to confirm eligibility of the patient for this trial. a) Primary tumor not controlled by locoregional treatments. b) Bilateral portal vein and/or hepatic artery involvement. c) Previous chemotherapy directed at treatment of metastatic colorectal cancer. (Note: Patients with previous exposure to adjuvant chemotherapy for treatment of the primary tumor are not excluded if the completion of the adjuvant therapy was greater than 1 year prior to enrollment.) d) Underlying acute or chronic liver disease. e) Patients with known Gilbert's disease. f) Patients receiving phenytoin or phenobarbital prophylaxis. g) Presence of any concurrent medical or psychiatric conditions that serve as a contraindication to surgery or chemotherapy. h) Pregnancy, lactation or refusal of female patients of child-bearing age to submit to a pregnancy test. i) Malignancy other than basal cell carcinoma or squamous cell carcinoma of the skin within the preceding 5 years. j) Use of another investigational medication concurrently or within 4 months of enrollment. This is a prospective phase II trial. The trial is uncontrolled and nonrandomized. It began as a single-center trial but it has expanded to a multicenter trial. Patients who are chemotherapy-naive will be analyzed separately from those previously exposed to chemotherapy; each of these groups will be compared to historical controls who underwent resection of liver metastases without receiving adjuvant chemotherapy. Subgroups to be analyzed include those patients who are non-responders to neoadjuvant chemotherapy and patients who are responders to neoadjuvant chemotherapy. The study is an open label study, where all patients receive neoadjuvant chemotherapy. Following resection, the type of chemotherapy administered will be determined secondary to evaluation of the response to preoperative chemotherapy. Patients may discontinue from the study voluntarily or be discontinued by the investigator. Patients who drop out of the study for any reason will not be replaced. The schema summarizing the treatment plan is depicted in Figure 1. Prior to initiating the protocol, a preliminary evaluation as detailed below will be performed. Patients will receive three cycles of chemotherapy (5-FU/LV/CPT-11) and will then be assessed for progression of disease. If progression is noted, they will be immediately assessed for surgery. If stable or responsive disease is observed, patients will receive another three cycles of chemotherapy. Surgery will be performed at the completion of this 12-week period of neoadjuvant chemotherapy. Following chemotherapy, patients will receive another course of chemotherapy for 24 weeks. They will receive 5-FU/LV/CPT-11 if they had a clinical response or stable disease during preoperative chemotherapy. In patients whose disease progressed during administration of 5-FU/LV/CPT-11 in the preoperative period, an alternative agent (eg: capecitibine, oxaliplatin) or best supportive care (BSC) will be offered, at the discretion of the treating physician. Typically, patients will be identified during routine follow-up surveillance, after treatment of the primary colorectal cancer. These patients will undergo a biopsy of a single liver tumor as part of their initial assessment, as well as the other investigations described in Table 1 (see Additional file 1). Patients with metachronous metastases 12 months or more after resection of the primary lesion will require a colonoscopy. Other patients will be identified at the time of surgery, during treatment of their primary colorectal cancer. These patients will not require a subsequent biopsy, if a biopsy of a liver tumor has been obtained. The minimal radiological evaluation of the patient will consist of an abdominal CT scan at the time of initial assessment. A MRI scan of the liver will also be desirable, although this will not be mandatory. After the chemotherapy and just prior to the planned surgery, an abdominal CT will be repeated; a repeat MRI is suggested, but is not mandatory. In the interval after the first course of chemotherapy, a CT will be required, to ensure that disease progression has not occurred. Initial (baseline) history and physical examination, as well as baseline hematology and biochemistry must be performed within 14 days of initiation of neoadjuvant chemotherapy. CT and/or MRI must have been done within 28 days of initiation of neoadjuvant chemotherapy. Intraoperative events and findings will be recorded in the usual way in the operative note. Blood loss, operating time, and blood transfusions will be recorded. The surgical team will monitor for complications in the usual manner and any complications will be treated appropriately. Duration of hospital stay, complications, and mortalities will be recorded. Quality of life will be monitored using the Functional Assessment of Cancer Therapy (FACT-C) Scale. Quality of life will be assessed at study commencement, and at the intervals described in Table 1 (see Additional file 1). Permission has been granted by the Center on Outcomes Research and Education to use the FACT-C subscale for this trial. The goal is to administer chemotherapy for up to 12 weeks in the preoperative period. All patients will receive CPT-11 180 mg/m2 on day 1 with 5-FU 400 mg/m2 bolus and 600 mg/m2 by 22 hour infusion and calcium folinate 200 mg/m2 on days 1 and 2. This will be given every 2 weeks for 6 cycles (12 weeks total). At 6 – 8 weeks, the clinical response will be assessed by abdominal CT scan and the degree of response will dictate whether the remaining three cycles of chemotherapy are given. If progressive disease is observed at the 6 – 8 week interval as assessed by CT, neoadjuvant chemotherapy will be stopped. Subsequent patient management will depend upon whether the tumor is operable or inoperable. If the disease is still resectable or ablatable, the patient will undergo operation. If the disease is no longer amenable to resection or ablation, the patient will be treated with BSC, as detailed below. Patients with stable or responsive disease will complete their chemotherapy to week #12 (a total of six cycles), then undergo surgery as per protocol. Patients who demonstrate complete clinical disappearance of disease at any time during the administration of preoperative chemotherapy will continue to receive the complete course of preoperative chemotherapy. Hepatic resection will proceed as planned and will include the segment(s) previously involved with tumor. In the case of a complete response, radiofrequency ablation and cryoablation will not be utilized. Once extrahepatic metastases have been ruled out and if hepatic functional reserve is sufficient, a laparotomy will be performed. Intraoperative ultrasound will be performed to assess for previously undetected lesions and to aid in the final assessment for resectability. Any suspicious lesions encountered will be biopsied to rule out extrahepatic disease. Extrahepatic disease precludes further surgery. Any enlarged lymph nodes in the periportal area will be submitted separately for examination. Micrometastases contained in periportal nodes are not a contraindication to resection. The extent of hepatic resection – anatomic and nonanatomic – will be determined by the operating surgeon. A resection margin > 1 cm will be the goal. If radiofrequency ablation or cryoablation are used, the goal is to ablate the entire lesion plus a rim of normal tissue, if anatomically feasible. In selected circumstances (eg: multiple bilobar metastases), radiofrequency ablation may be administered percutaneously, at an interval, prior to resection. The exact sequence and the method of ablation will be determined by the operating surgeon. In some patients, especially those with comorbidities that prohibit a formal hepatic resection, radiofrequency ablation may be preferable instead of or in addition to resection. In such patients, radiofreqency ablation will be administered percutaneously or during a laparotomy, depending on technical circumstances. The LeVeen probe will be guided under ultrasound or CT guidance and the entire lesion will be ablated. The endpoint of ablation will be marked by the sudden increase in impedance. Completeness of resection is defined below. If there is no evidence of residual disease, therapy will be continued as per protocol. If there is evidence of residual disease following resection or ablation, the patient will be classified as an event for DFS and will be treated with postoperative 5-FU/LV/CPT-11 or best supportive care, as directed by the response to neoadjuvant chemotherapy. Adjuvant chemotherapy will be administered beginning at 21 – 72 days after surgery. All patients with stable and responsive disease following chemotherapy who undergo liver resection or ablation will receive 12 additional cycles of CPT-11 (180 mg/m2 on day 1) with 5-FU (400 mg/m2 bolus and 600 mg/m2 by 22 hour infusion) and calcium folinate (20 mg/m2 on days 1 and 2) every 2 weeks (for a total of 24 weeks). Patients with resectable disease who had progressive disease during neoadjuvant chemotherapy will be offered an alternative agent or BSC, at the discretion of the treating physician. Those patients who are not rendered free of disease following the neoadjuvant chemotherapy and surgery will receive palliative therapy as outlined below. Patients who progress to a state of nonresectability, or who have gross residual disease following surgery will be offered the following options, at the discretion of the treating physician: a) symptomatic measures only (BSC); b) second-line chemotherapy (eg: capecitibine, oxaliplatin); c) another study drug. The degree of response to neoadjuvant chemotherapy will be assessed by either CT scan or MRI scan, using the RECIST guidelines . In assessing response, the same radiologic modality (ie: CT or MRI) that was utilized to estimate extent of intrahepatic disease before chemotherapy will be utilized to estimate extent of disease after chemotherapy. Up to 5 "target" lesions will be identified and these are selected on the basis of their size (ie: those with the longest diameter). Baseline evaluation will consist of determination of the sum of the longest diameters of the target lesions, measured in millimeters. "Nontarget" lesions will also be enumerated and followed. Radiologic response of all lesions seen on MRI will be correlated with findings on surgical pathology. The definitions of response are described below. A complete response is the complete disappearance of all target lesions and nontarget lesions, the absence of any new lesions, the absence of disease-related symptoms, and no evidence of non-evaluable disease (including tumor markers and other laboratory values). This must be confirmed by the absence of any microscopic residual viable tumor in the resected specimen. A complete response will not be assigned if any viable cells are present in the resection specimen, regardless of the radiologic appearance. A partial clinical response is a reduction in the sum of the longest diameters of target lesions by at least 30%. No growth of nontarget lesions is apparent and no new lesions have appeared. Any response that is not defined as a CR, PR, or progression. Progressive disease is defined as at least a 20% increase in the sum of the longest diameters of the target lesions, and/or appearance of one or more new lesions, and/or unequivocal progression of existing nontarget lesions. Failure to return for evaluation due to death or deteriorating condition (unless clearly unrelated to cancer) will also be considered progressive disease. Worsening of existing nonevaluable disease does not constitute progression. Neoadjuvant chemotherapy will be stopped when disease progression is observed and subsequent treatment will be administered as described. Disease may become inoperable following preoperative chemotherapy due to the development of medical contraindications or because of progression of disease. Further therapy for patients with inoperable disease due to the development of medical contraindications will be at the discretion of the investigator. Inoperability secondary to progression of disease will be determined by the surgeon using preoperative radiographic studies or while in the operating room. The interval from the first observation of a response to the first observation of progressive disease, or to death due to any cause, or to the time of early discontinuation of treatment due to progressive disease. Interval from the start of the preoperative study drug to the first evidence of progression. Interval between complete surgical ablation and evidence of recurrence as seen clinically or radiologically. For the determination overall DFS, an event is defined as the first occurrence of one of the following: inoperable disease; residual disease following surgery; local, regional or distant recurrence of tumor; second primary cancer; or death from any cause other than cancer. Elevation of tumor markers does not define a recurrence. Location and extent of recurrence will be recorded. Defined as evidence of tumor in the liver as determined by needle biopsy, surgical specimen or autopsy. Further treatment of local recurrence will be at the discretion of the investigator. Defined as the development of tumor in the liver, extending to locoregional lymph nodes and/or contiguous structures such as the diaphragm, colon, and extrahepatic vascular structures. Diagnosis must be confirmed by needle biopsy or by radiographic documentation that the mass lesion is increasing in size in the absence of treatment. Further treatment of regional recurrence will be at the discretion of the investigator. Defined as development of tumor at sites distant to the liver. Diagnosis must be confirmed by needle biopsy or autopsy or by radiographic documentation that the mass lesion is increasing in size in the absence of treatment. Further treatment of regional recurrence will be at the discretion of the investigator. Interval from the date of liver biopsy to the date of death, regardless of cause. Cause of death will be recorded. All analyses will be made on an intent-to-treat basis, which will include all patients who received the first dose of the neoadjuvant chemotherapy. The number of patients completing the planned visits during the study will be described. Patients who discontinue study drug or are removed from the study prematurely will also be reported. Enrollment (treatment) errors, reasons for study discontinuation and time of withdrawal from the study will be described. Patient baseline characteristics will be summarized. Frequency tables will be presented for categorical variables and descriptive statistics will be utilized to summarize continuous variables. Study drug administration will be described in terms of the total number of cycles administered (neoadjuvant and adjuvant); dose intensity; relative dose intensity; dose modifications, dose delays, and dose omissions. The overall response rate (with 95% confidence interval) will be presented. The influence of baseline patient characteristics on this outcome will be explored using logistical regression procedures. Analyses of other outcomes (eg: hepatic disease-free survival, time to progression, overall survival, resectability rate, surgical complications, etc.) will also be conducted. For time-to-event data, Kaplan-Meier procedures will be used. Safety Analyses will include an analysis of all adverse events. All subjects enrolled in the study who received at least one dose of study medication will be included in the safety analyses. The number of patients to be studied should demonstrate a difference in 2-year disease-free survival of 25%, given an estimated 3-year disease-free survival in the absence of this regimen of 40% (ie: Po), with an alpha of 0.05 and a power of 0.8, by a 2-tailed test. It is estimated that 70 patients will be required to demonstrate such a difference. It is estimated that 25 – 30 patients will be accrued per year and the study will therefore require 2 – 3 years to complete accrual. The study will be stopped if ever convincing evidence is generated that nonresectability after the neoadjuvant chemotherapy is >20% (which is an estimate of the nonresectability rate in the absence of neoadjuvant therapy). The decision rule is based on Table 2, which depicts the number of patients that would have to be found to have unresectable disease, given a certain number patients who have received the therapy (with 95% confidence intervals). For example, once 10 patients have been accrued, if 5 patients have been found at the time of operation to have unresectable disease, then the study will be stopped. The trial will be performed in accordance with the recommendations guiding physicians in biomedical research involving human patients adopted by the 18th World Medical Assembly, Helsinki, Finland, 1964 and later revisions. The trial has been approved by the Conjoint Health Research Ethics Board at the University of Calgary. As the trial expands to involve other centers, local ethics committee approvals will similarly be required. Most reports on neoadjuvant chemotherapy for liver metastases focus on the utility of the strategy in the context of unresectable disease [16, 17, 20]. In this context, metastases can sometimes be converted to a resectable state. There are a number of theoretical advantages to administering neoadjuvant chemotherapy in the context of resectable disease. On the other hand, these postulated advantages must be balanced against the risk of disease progression, as surgery is delayed for systemic chemotherapy. Disease progression may be an adverse outcome of the protocol, but it could also be viewed as a positive selective influence. That is, if intrahepatic disease progresses to a point where resection is no longer an option, then preoperative chemotherapy has not served the patient well. In contrast, if an extrahepatic focus of disease appears while on chemotherapy, then the interval of observation was useful in averting an unnecessary metastasectomy. An additional potential risk of the protocol is that of postoperative liver dysfunction, as chemotherapy is known to be associated with steatosis. It is these safety issues that this phase II protocol is designed to address. At the time of submission of this protocol for publication, the study is already in progress. So far, 22 patients have been accrued and none of the criteria for discontinuation of the study have been reached. Some changes to the protocol are anticipated, but still require regulatory and ethical review. In particular, the upper limit of the age inclusion criteria will be eliminated (so all patients aged 18 years and older will be allowed to participate), In addition, we will include patients who have received adjuvant chemotherapy for their primary tumor if given 6 months or more prior to enrollment (as opposed to 12 months). These revisions to the inclusion criteria were made because it was thought that there was a reasonable chance of benefit from the protocol, in patients with the revised criteria. At present, two centers (Calgary and Edmonton) are actively accruing. A number of other Canadian centers have been invited to participate, in hopes that the rate of accrual will accelerate. This will also serve to expose other centers to this unconventional method of treating resectable liver metastases, facilitating further studies in the future. The data derived from this study will be used to decide whether to proceed with a phase III study, perhaps comparing patients treated with this perioperative approach to patients treated with postoperative chemotherapy alone. The authors wish to thank Ms. Jennifer Koppel for ensuring the protocol description and conduct is up to regulatory and ethical standards. This study is supported by Pfizer Canada Inc.
OFB conceived of the study, participated in the design of the study, and drafted the manuscript. SD and SE participated in the design of the study. FS, ED, CB, DB, BW and DR have enrolled patients on the protocol, and have made contributions to the design and methods of conduct of the study. All authors read and approved the final manuscript.